After the Snow Geese stippled our little Honda with their version of a Pollack drip painting, I waited a while before heading to the car wash, thinking it would be a waste of resources when the rain would just wipe the body clean within a day or two. But, faithful to Northwestern climate patterns, the rain came in fine mists rather than cleansing sheets. 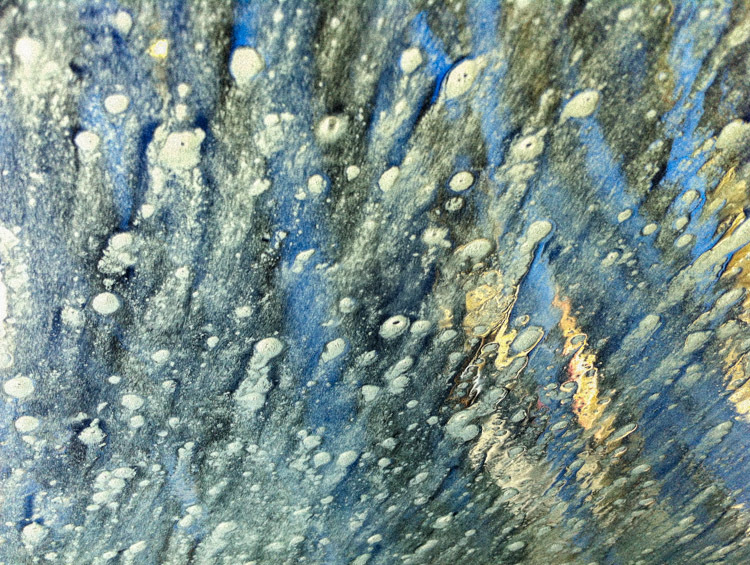 A few days of drizzle left us not with a clean car, but with an even broader canvas of goose abstractions. 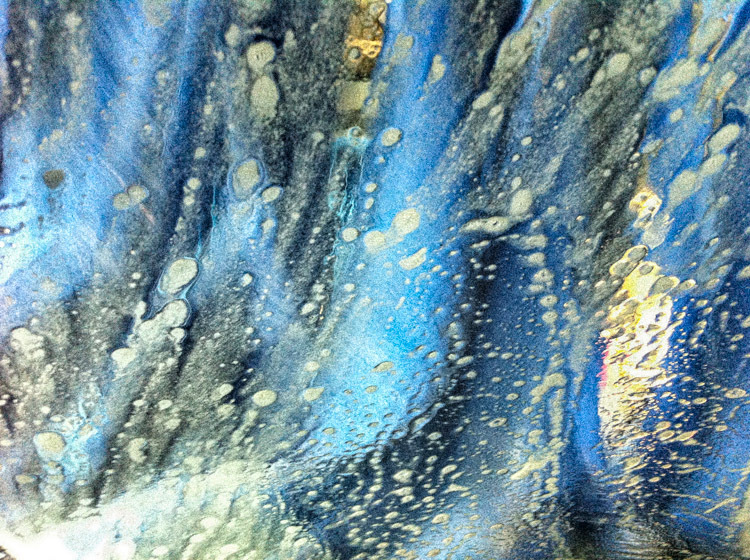 I was car-wash bound. I don’t know why my heart races when I coast up to the wash zone — the type you navigate hands-free, with brake off and gear shift in neutral. There must be some buried anxiety trigger of being trapped in a box with a soapy Typheoeus or Typhon, father of all Greek monsters — this one with dangling blue shammy strips for legs instead of vipers. To distract my mind, I pulled out my old iPhone and capture Typhon, crude, loud and blue, sweeping his shammies across the windshield. It occurred to me that the application of water and soap was creating a derivative work from the goose stipple. 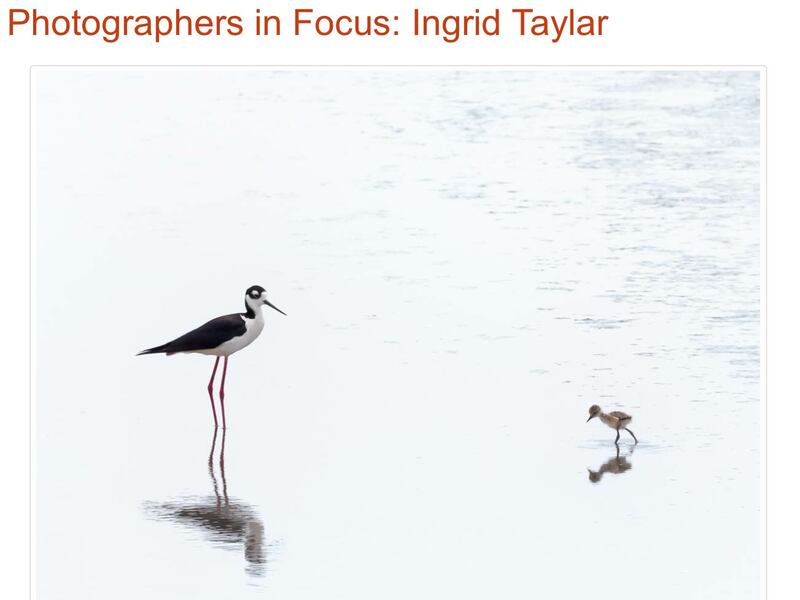 It wasn’t the goose splotches themselves (which were blasted away with the first jet spray), but rather the bubbles, stripes and cascades that decorated my view … all because the Snow Geese alighted over me, without even a sense of their own creative, spring rhythms. I think you have a good eye for windshield patterns. I remember having seen in another post of yours another windshield scene with frost, I believe. I also bookmarked that website about Greek mythology. I also had to go back to Greek mythology when I got into reptiles. When I got into snakes I had to go back to Hermes and Asclepius who both held a Caduceus shaft, to emphasise and protect the positive qualities that serpents possess. Both Hermes and Asclepius had shafts with serpents around them. 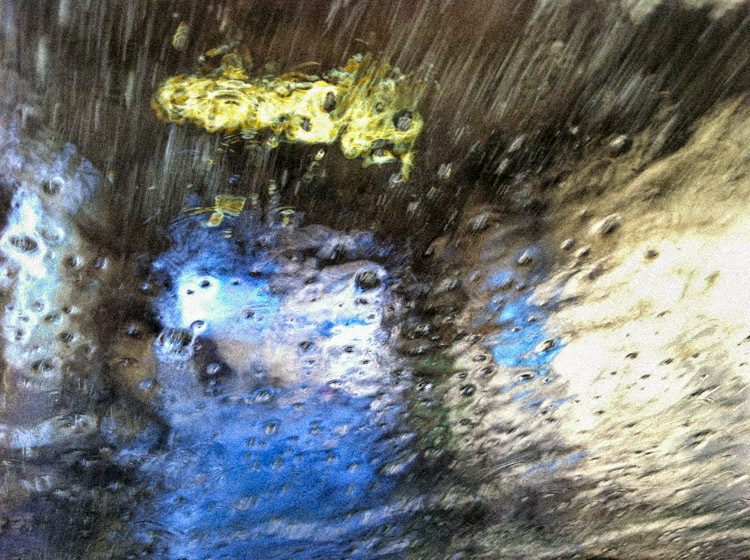 Ingrid, I would never have thought to take car wash images and these are fascinating abstracts! Great eye. But this is good stuff! Love to see how others have escaped into magical spontaneity!